Text: You may have noticed that conspicuously few old people go to the cinema. Even if you take into account that older people are as a rule more frugal and more comfortable, and all in all, less profligate than the rest of us, it’s not a sufficient explanation for why so few of them indulge in the depraved invention of luminous pictures. The older generation expresses open disgust for this modern spectacle. They mutter something like, ‘Don’t bother us with such tosh,’ and open yesterday’s paper or a fifty-year-old novel instead. Meanwhile, the said fifty-year-old novel is being enacted on the screen of a picture palace round the corner, and the rest of us, who are breathlessly watching its flying action, can’t understand that an old man has the patience to read such ancient trash. The average film is, in the vast majority of cases, much closer to Walter Scott than to, say, Vít Nezval, and resembles George Sand more closely than George Bernard Shaw. The average film doesn’t pick up on modern literature, but on old literature. As a matter of fact, it’s the direct successor of old novelistic fiction. The younger generation doesn’t realise that in the cinema they give themselves up to the lush imaginative world of their distant fathers. The older generation doesn’t have an inkling that the shadowy pictures they are so contemptuous of are bone of their bones, or rather I should say the shadow of their bones. Which is of course a typical, unbridgeable rift between the generations. It seems to me, then, that the older generation doesn’t reject film because it’s too modern, or too silly, but for more profound reasons: because it’s too fast and isn’t rendered in words. I am of the opinion that older people would take pleasure in going to the cinema if texts instead of pictures were projected on the screen. In the beginning of their world is the word, not an optical event. A picture in itself, a picture without language, doesn’t mean anything; it must get words to acquire reality. An old man sees just shadows, shadows, shadows on the screen, bolting, and unreal. If they waited for a moment, he could find a term for them and describe them in words. But alas, they’ve gone, and new shadows are fluttering there in a mute hurry of events. The word lasts, the word can be remembered, the word is solid and firm. But movement doesn’t last long enough to be interpolated into what exists and what is valid; it’s just a change, a transition, and not a decent, reliable, enduring being. An old man watches the running film as if dreams were being shot before him; if he read in a book about a lissom damsel walking like a doe, he’d believe it, but when he sees a lissom damsel on the screen, walking like a doe, he doesn’t recognise this poetic moment because it’s not written there with binding words. It doesn’t say anything, it’s just phoney and monkey business. And the old man leaves the cinema as if he hadn’t seen anything. Don’t bother me with such tosh, he says. A kind of re-education of people has really taken place here. 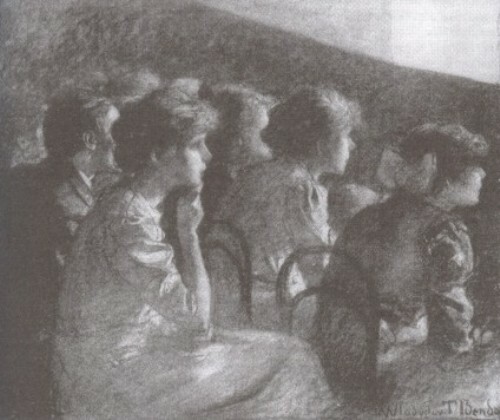 A person sitting in the cinema must have found a shorter connection between the eye and the brain without the medium of words; in a technical sense, he may even have found a direct connection between the eye and the brain. The older generation probably lacks this direct connection, this leaping of a spark from the retina straight to the cerebral centres. They are more of a reading, conceptual type, while today’s man is becoming a visual type. My late Granny had to read out loud to properly understand what she was reading, for her the word was still an auditory, not a visual, image. In bygone times most readers must have perceived reading through the ear. Later on a more trained reader dropped this aural digression and understood directly by means of verbal signs. In film even the word has turned out to be a digression; we are learning to understand without words. I don’t want to decide if it is progress for the time being it’s a fact. But surely film threatens literature to a considerable extent, not because it wants to replace it, but because it develops another kind of people – a visual instead of a reading type. The reading sort is patient; it takes its time to penetrate the circumstances, to bask in the descriptive passages and follow the conversation from start to finish. The visual type will not be so patient; it wants to seize the situation in a single glance, to comprehend the story without letting it last, and immediately see something new. But perhaps one day people will run from that stampede of pictures back to the book, to take a breather, or rather, they’ll have the radio narrate fairy tales and novels nice and slowly for them; they’ll listen with closed eyes, letting themselves be lulled by the word, which will re-assume its original destiny – to be spoken language. Maybe who knows? – maybe the book will die out, maybe it will become a curious cultural heritage like inscribed Babylonian bricks. But art will not die out. Comments: Karel Čapek (1890-1938) was a Czech novelist, essayist and playwright, best known for his science fiction works including the play R.U.R. which introduced the concept of the robot. He was no enthusiast for the cinema, but liked the audiences. Vít Nezval was Vítězslav Nezval, a Czech avant garde poet. This entry was posted in 1920s, Czechoslovakia, Newspapers and tagged Cinemas, Elderly, Intertitles, Karel Capek. Bookmark the permalink.